Ghaziabad Development Authority (GDA) also launched new EWS / LIG housing scheme for 1979 multi storey flats along with Indirapuram Flats Housing Scheme. The GDA launches EWS/LIG housing scheme for 1979 flats especially for economically weaker section and the lower income group of the society under this scheme GDA will provide 1979 multi storey flats in developed areas for EWS and LIG. The code of the scheme is 002. 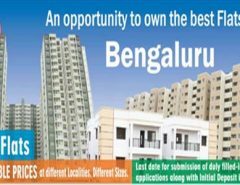 The flats are developed by the private developers and the application for the scheme is accepting via online mode only from 1st November to 30th of November 2014 and the draw result for the scheme is expected to be announced within 6 months according to GDA brochure. As I said above that authority is offering 1979 flats in EWS and LIG category in which 900 flats are offered under EWS category with a minimum 25 square meter of area and 989 flats under the LIG category with minimum area of 35 square meters. 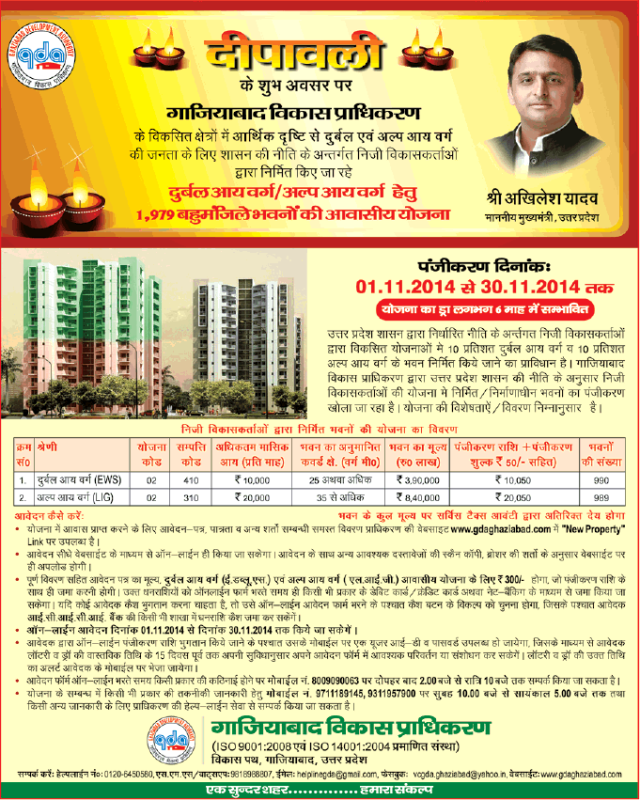 The estimated cost of flats according to Ghaziabad Development Authority is Rs. 3,90,000 for EWS flats and Rs. 8,40,000 for LIG flats. You can apply online mode only through the official website www.gdaghaziabad.com while applying online need to upload scan copy of photograph, signature and documents. The list of required documents will be displayed to the applicant upon selecting the category on website. The registration amount is as follows for EWS flats is Rs. 10,050 and for LIG flats is Rs. 20,050 respectively which can be made via credit card / debit card or net-banking. In any case applicants has no such facility to pay the amount online then don’t worry you can deposit the amount in any branch of ICICI bank in India. ICICI bank is also providing the loan facility for this scheme and the interested candidates can contact at 9540973521 regarding the same. I am sure you find it worthwhile please don’t forget to give your feedback. Advertisement is given below as well. Thank you so much Sandeep for your positive feedback and appreciation. hi sir i just fill the form for LIG flat in the latest GDA scheme however i just wanted to know about the exact location of LIG and EWS flat\\\’s. As per your sms Am trying many times to login my registerd id which id given me at the time of registration, but I cant found the option which site will be for sheen my status of application form. Sir plz tell me what to do in that situation as soon as possible.